Guillen's was founded in Miami, Florida in 1973 by Master Plumber Jose Guillen and his wife Yolanda. Guillen's Plumbing is conveniently located near the Turnpike and US41 on Flagler St. in Miami. Click for directions and address. Come view our large selection of toilets in our Miami showroom from Duravit, American Standard, Kohler and more. 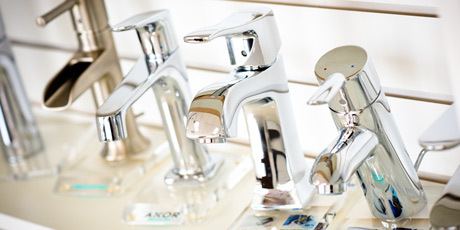 We carry all different shapes and finishes of kitchen and bathroom faucets from the industry's best manufacturers. Look no further for the perfect finish to complete your bathroom project. Inspired by the original Jacuzzi® Water Rainbow® faucet made popular years ago, luxury materials and components take this classic concept to a whole new level. Click to see more. With Moen’s new customizable shower technology and personal device integration, you control it all. With its concealed tank and minimal footprint, the innovative Veil wall-hung toilet saves up to 12 inches of precious bathroom space over KOHLER's longest floor-mount models. Kohler’s latest multifunction showerhead and handshower with Katalyst® air-induction spray creates large, full drops for maximum coverage. In 1973 Master Plumber Jose Guillen started Guillen’s with his wife Yolanda. Beautiful design meets ultimate function with touchless faucets. Offered in an array of different styles and finishes with multiple showerhead options, Moen's Magnetix™ has the timeless style to finish any new bathroom design, or add life to your existing shower. The latest sinks, showers, tubs and more on display from the USA's top manufacturers. Guillen's is an authorized dealer of Grohe, Toto, Jacuzzi, Kohler, and Delta products, among others. Shop with confidence! Traditional, modern, and beyond. Come explore our showroom. Guillen's Plumbing caries a great selection of bathroom hardware and accessories from the top brands. Our conveniently located showroom offers the latest styles of kitchen and bathroom facets, fixtures, sinks and tubs. Need a part? Guillen’s has it! With parts from all major manufacturers, we’ve got the plumbing parts you need in stock. Guillen’s Has The Latest kitchen and bathroom plumbing fixtures and accessories, and is the number one volume plumbing parts distributor in the USA— located right here in Miami. For over 40 years, Guillen’s Plumbing in Miami Florida has been helping residents and plumbers find the right parts or fixtures to fit their specific needs. Years of operating our ever-expanding online parts website has given our friendly staff valuable experience which they love to share with customers of our storefront. 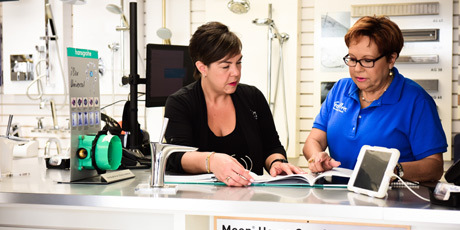 Call or stop by our Miami Plumbing Showroom to try the latest in plumbing fixtures and kitchen and bathroom accessories, or to find the exact parts and supplies for your project the first time.